Follow me on Twitter. Add me as a friend on Facebook . Visit my Flickr photostream. The above quote is from a poem I read long time back, but can’t exactly remember the poet now. It says, give me the sweet yogurt the one who carries the pot with him. A few days back when I saw Dolon write about Mishti doi on her blog, the sweet greedy Bong awoke within me. Mishti doi reminds me, and probably all Bengalis an earthen pot filled with a brownish mass of sweet curd. Misti doi is an inseparable part of all festivals in Bengal- be that a tika (a dot on the forehead) for Bhai phota (festival to mark the well being of brother), or the charanamitro (offering made to God during worship), or just a dessert to end the meal for a feast. While we were searching for links on Mishti doi, K found an interesting one. I never knew this; SJ prepared it in an oven. That is really a nice and quick way to prepare misti doi, I believe. The post even wrote about the mention of curds in Vedas as the “Food of God”, and probably that explains why it’s offered during all rituals. I have tried out mishti dahi in Bangalore too, but here it’s sold in plastic containers. The smell of the wet earthen pot holding the misti doi gives the actual feel of this dessert. So, when I came back to Kolkata yesterday I just couldn’t wait to devour some misti doi. Earthen pots are easily available here, and mom had some handy in her kitchen, so that was not a problem at all. While the color of the yogurt helps all to remind them of this dessert, there are some sweet shops in Kolkata too where mishti dahi looks white similar to the set sour curd. 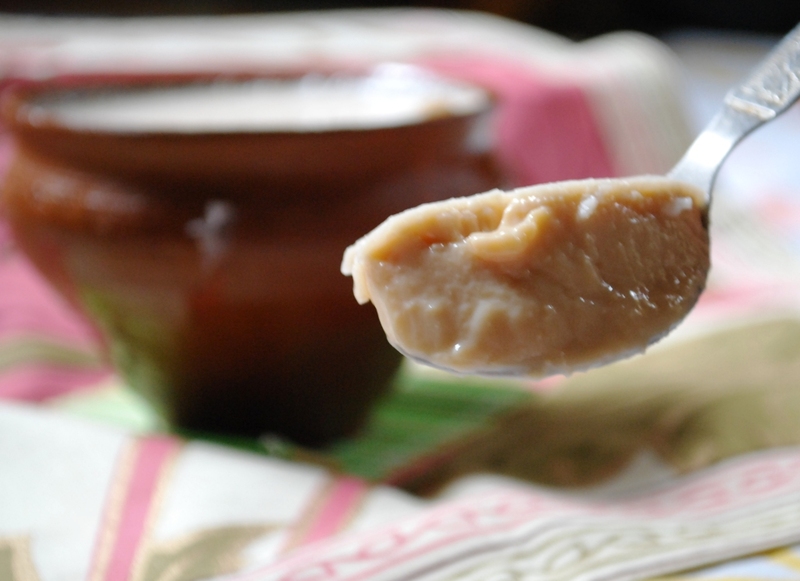 Mishti doi though a very popular dessert throughout Bengal, it is rarely prepared at home. This may probably because it’s readily available in the market (sweet shops in Bengal are more frequent than light posts on the streets) and also preparing it takes a long time almost over night and even more. So a time taking recipe, but still is worth all the labor. Here, it is all for you to grab. Hot tips – Instead of using yogurt to set the dahi, freeze-dried bacteria can also be used for the same purpose. Linda is celebrating the World Breast Feeding Week on her blog with the event Got Milk?. Mishti doi is on way to the event. I am first time visiting your website. Its great with so many mouth watering recipes. You have explained nicely. Easy to understand & prepare.